On January 16, an article appeared in Forbes counting down the 10 happiest and unhappiest cities to work in the U.S. Based on an annual study by CareerBliss, a career information site, Austin is the No. 5 unhappiest city to work in right now. Wait, what? What about our reputation as a top city for job seekers? And the fact that we're a great city for STEM careers? Sure, our traffic is so terrible we have to talk about it all the time just to make ourselves feel better, but we see sunshine 300 days a year and live in a city where it is culturally acceptable to eat tacos for every meal. According to Forbes, certain key factors (not including tacos) were considered in this study "including work-life balance, an employee’s relationship with his or her boss and co-workers, general work environment, compensation, opportunities for advancement, company culture and resources." Okay, so everyone could probably earn a bit more money, but work-life balance? Surely our abundance of festivals, innovative restaurants, green spaces, happy hours, live music and penchant for being outdoors would disprove this. Could it be the city itself making us so unhappy? Though she fails to elaborate, Heidi Golledge, CEO and co-founder of CareerBliss, says that is a potential factor. “Where you live can definitely impact your overall happiness and even your perceived happiness in your career,” Golledge told Forbes. So just where are these happy places to work? Coming in at No. 1 is Miami, Florida, followed by Sacramento, California (No. 2); Las Vegas (No. 3); Orlando, Florida (No. 4); Washington, D.C. (No. 5); Los Angeles (No. 6); Hartford, Connecticut (No. 7); San Antonio (No. 8); Birmingham, Alabama (No. 9) and New York City (No. 10). 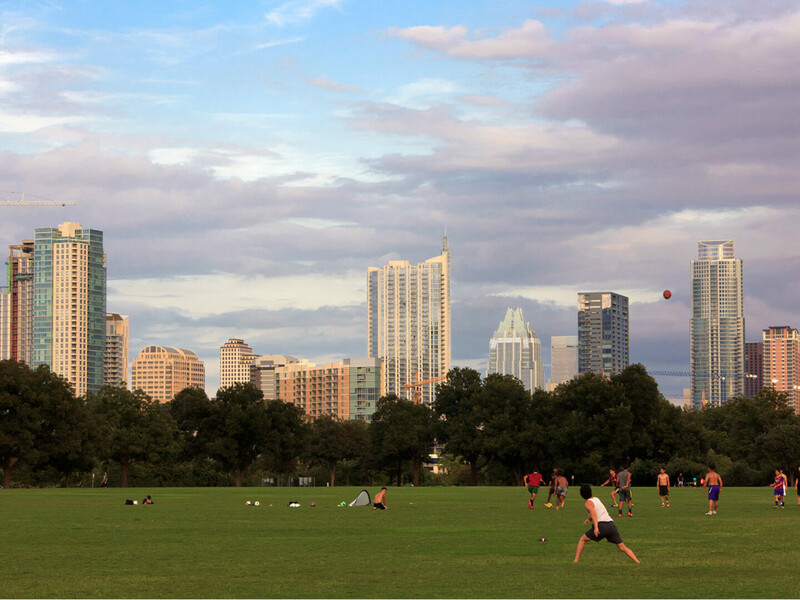 A quick scan of the top 10 happiest places to work leaves us with one overwhelming question: How can living in Orlando, Florida make anyone happier than living in Austin? Unless you're working as Cinderella and get a Disney World parade thrown in your honor every night (which we imagine is just wonderful), what exactly is so great about Orlando? These are real, haunting questions that Forbes fails to answer. Joining us on the unhappy list are Cleveland, Ohio (No. 1); Indianapolis, Indiana (No. 2); Kansas City, Missouri (No. 3); Salt Lake City (No. 4); Cincinnati, Ohio (No. 6); Louisville, Kentucky (No. 7); Houston (No. 8); Tulsa, Oklahoma (No. 9) and Chicago (No. 10).